It seems to me that Belize got Set up, Swindled and Hoodwinked, …before the suggestion to take Guatemalan’s claim to the ICJ , it seemed to be going well for Belize Internationally. We had our issues but we were developing…Guatemala for the most part was not an issue for us and the Guatemalan claim for Belize was dying a natural death; I would argue that any claim by Guatemala in the world arena would be seen ridiculous as the world has given Belize LEGITIMACY in every world organization…. Lo and Behold, enter the brilliant yet inept legal minds in Belize, the ones who bill our taxpayers for self benefiting pursuits, the same brilliant legal minds who have yet to effectively address or solve our internal failing justice systems, decides to become legal super heroes and take up a centuries old issue and solve a claim already settled with our induction into the U.N. They agreed and signed a contract, without any previous consultation with the Belizean people, to risk our sovereignty. They ask Belizeans NOW to trust them, and vote yes for our future to be determined by Judges who could care less how their vote affect us. A vote where ONLY Belize stands to lose. Today and 30 plus years after Independence we are being told by the very leaders who have raped our natural resources, our public coffers, enriched their family and friends and sold us out to the highest bidders to trust them wholeheartedly and take Belize claim to the ICJ to establish our already established sovereignty…in their arrogance, unquenchable quest to prove to the world what is already accepted, over-confidence and maybe a sweet lingering anticipation for a Nobel Peace Prize or likely oil and trade contracts to fatten their law firms…. decide to legitimize a dead claim, accept blood money to buy our people the same way they buy votes and citizenship to win elections. Suddenly Guatemala’s claim comes off life support and becomes relevant once again and as you are witnessing, Guatemala is wasting no time and using it to their advantage to make their public relations argument to the world and likely the ICJ …now it gives Guatemala grounds to make a stand in what was a ridiculous claim. 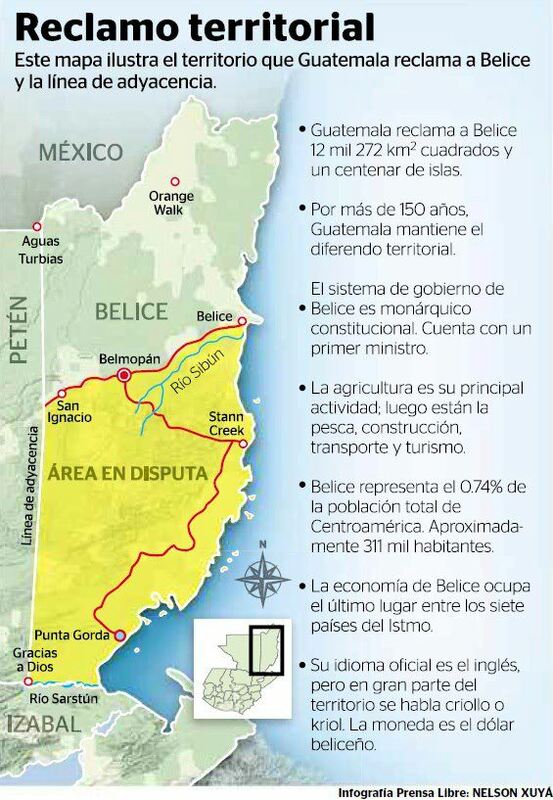 Belize has handed Guatemala legitimacy, simply by agreeing to this nonsense. In our leaders’ blind trust and more likely love for the European and American money; they push Belize down an amnesic path, forgetting the magnitude of woes Europeans and Americans have created in Belizean society…. Motherland England, Ashcroft, Prosser, McAfee and maybe quite a few unknowns have instrumentally stripped our country of wealth, reputation and democracy with the willing enabling help of the very Bar members arguing for us to go to the ICJ and trying to convince us that they have Belize’s best interest at heart. These agents of first world countries come to Belize and tell us how to think and what is good for us and our misguided leaders drunk in their power, believe they speak for us and saw no need for prior consultation before subjecting the entire country down this path. Our leaders lack foresight by their failure to acknowledge we live in a corporate world, a new world order where governments are nothing more than agents for corporations and oil companies…. So Now Guatemala is redrawing maps and making a mockery of us. This is exactly what Guatemala wanted all along …a world audience to revitalize an old dying claim and maybe convince the political body of the ICJ to make a “legal” ruling in their favor. One thing I have learned, the dumbest people are the most educated at times. They lose their common sense; they become arrogant trained monkeys who believe a degree gives them superior intellect. They are normally the easiest to prey on because one just needs to pander to their super egos and play up to their elitist perception of intelligence. I pray my Belizeans Vote NO and then put our leaders in check! They work for Belizeans, and they should serve Belize always. Is it possible a deal has already been ironed out and they just need the ICJ to remove culpability from their actions? Belize is NOT for gamble and if one inch of soil or sea is given to Guatemala, Belizeans MUST hold our leaders accountable. site taste is perfect, the articles is in reality excellent : D.
Belize as I understand was part of our country or not??? 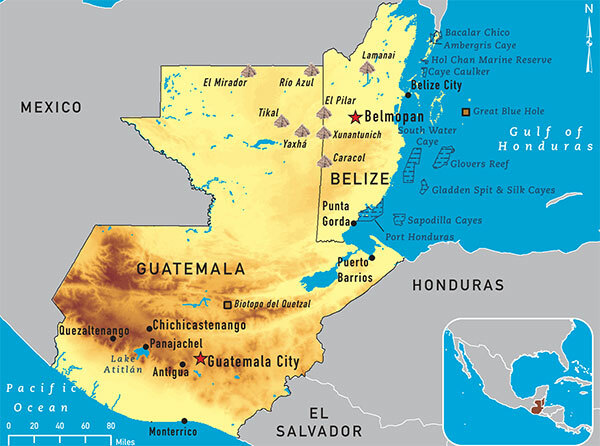 Since I was born and I grew up I always saw Guatemalan map with Belize ad a part of it. As was taught that Guatemala entered a convene with England. Is that right? In past years it was agreed that England would export wood from Belize in exchange for a road construction from The Border with Mexico all the way down to El Salvador??? Am I right???? So I that was agreed upon, how come England is the motherland” can somebody explain that to me??? Or it was taking by force like the Malvine Islands???? Eh???? Voting No was not going to make Guatemala’s claim go away. It may temporarily disappear if there’s a change of government in Guatemala, or if they find that there are more important things to focus on. But the fact that it’s reared its head so many times in the past (including during the last 31 years that Belize has been an independent sovereign nation, with well-established and internationally-recognised borders) suggests that Belize hasn’t heard the end of this. Even though the current process seems to have come to a halt (due to Guatemala pulling out of it), it may well start again in the future. And if anyone consults any lawyer who knows anything about these kinds of disputes, they’ll find that the chances of Guatemala winning are as small as the chances of Belize winning are high. So maybe that in itself is a reason to vote Yes, if this process ever re-starts (or re-appears in the future). Perhaps a ruling by an international court might finally convince Guatemala that their claim is baseless, and settle the matter once and for all? Thanks for your input on my blog. Your comments are appreciates. While that may be true what you said, Guatemala would need to be a serious participant in the process..I think that Belize should seek international support and protection- I think Guatemala fight is with the UK and NOT Belize. I am pretty sure we love Belize and Belizeans. We hate the intromission of these so called super potencies in our countries. We love Belizeans but they do not want to be part of our country why??? They had theirs brains washed out???? What matters here is the vote at the UN that recognized us as an independent nation with all our boundaries and maritime and insular territories intact back in 1980 which led to our independence on the 21st of September, 1981. Our independence was never conditional. From then the world told Guatemala that Belize is an independent nation and that our territory is sovereign and intact. Never, from the time of Rt. Hon. George Price, have we been willing to negotiate or compromise even a square centimetre. Yet, those so called leaders signed to a compromis that compromises our territorial integrity. The compromis is heavily biased and prejudiced against Belize in that there is nothing in exchange for Belize, for putting up its territory for determination by the ICJ. If the ICJ rules that Belize needs to give up land or sea, then we lose such territories and Guatemala wins such territories. Contrarily, if the ICJ rules that our territory remains intact, then what does Guatemala lose? Nothing-because they remain without territories that they already do not have. What does Belize win? Nothing – because we remain with territories that we have presently. It is incomprehensible how it is that our so called leaders and negotiators agreed to this question without including aomething for Guatemala to give up or lose. In other words, even though I do not agree with the referendum issue, if anyone wants to give them the benefit of the doubt, then the question to be determined by the ICJ should have also included that in the case that the ICJ rules our territories intact, they will order Guatemala to expunge their claim to Belize from their constitution and renounce their claim eternally. It is just plain common sense in negotiating and in business. That is why I, my family and my friends do NOT support going to the ICJ and we will all vote NOOOOO! One of my concerns Ramon is why it was allowed that the claim and our independence be pulled apart when it was known that for our Independence to be fully accepted the claim had to be dealt with prior. It is my opinion that we have been led to this point in time on purpose for a reason yet unknown. And our own people are leading us to slaughter. If you take the time and make the effort to educate yourself as to the history of the dispute you would immediately realize why we are where we are, and that it is not even an open secret, and that there is nothing sinister or untoward about that. Only someone who is a classic paranoid would think otherwise. As we both know we are both basing our opinion mainly on opinions. I ma reading up on the facts and the more I read the more I learn that this is mainly not in our favor. Especially hearing the debate for the side you sit on Glenn. You may not say it our loud but it is clear that you all ARE campaigning for a YES vote. At least I am honest and open about why I say what I say. Like I said prior, I may just end up making a change on my decision but that is left to be seen as time goes by and I educate myself more. For now, I wish for the education campaign be a level thing. Showing people the benefits of going and not going as well as the worst case scenarios on both options. Not just that we have done everything there is to do already and this is the last option when we know it is not so. Or scaring people into thinking that if don’t go to the the claim will not go away when we know that even if we go the claim may still remain. Also, being “uneducated” or “Unlearned” should not disqualify one from using common sense to make judgements or share ideas and thoughts. My paranoia comes from the LONG history of how politics works in Belize, I grew up in it on both sides of the field and I agree with Aria oh the point that we are expected to trust a system that has for 30 plus years proven that that is the LAST thing one should be doing. As to the “why we are where we are” thing. So far I have learnt that the reason we are here today is because those that were dealing with this on the past literally screwed us over. Check how the dispute was separated from the process to grant us independence. THAT is what has us here today. This issue could have been resolved a long time ago IF it was to be. If the basis of our Independence was dependent on our borders and being legally demarcated then why did they not deal with this FIRST & FOREMOST? They knew it would have been an issue there after and it was left that way. On purpose or not.. It is the very system that “wants” to help us that screwed us in the first place. Like I keep saying Aria, we are here on purpose. Why? I haven’t quite put my finger on it yet but there is something there. I agree with you on this. Little things are adding up and the puzzle is coming together. Soon people will see the real bigger picture, hopefully it’s not too late to turn back once they do. Belizeans were consulted through the political process Aria, you just weren’t paying attention. This phase of the effort to find a lasting solution to the differendum started in 2005 with the signing of the framework agreement. It has been discussed publicly by our elected officials several times, and there never was and never will be any bar to any citizen making their representation. I think I mentioned to you some place else that I attended a meeting for the media a few years ago where the entire issue was discussed at length, but only a handful of journalists made the effort to attend. One of the problems caused by the reality that there is a claim to our country is that we have to expend time and treasure to defend ourselves against it and that is a real cost in every calculable way and by any measure. As to your other point, you honestly, sincerely expect the UK or anyone else to say anything else? What would that be, we want you to settle differences so that someone loses? You have the option of being undiplomatic in your language as evidenced above but I am hard-pressed to see how it would be helpful if our international partners in this endeavor were to follow suit. Which people Glenn? I for one have not heard a public invitation to any political process nor was I asked my opinion about any signed agreement. I don’t know if any other “Normal Belizean” (How I love that term) that got an invitation to participate. Do you have a link to the media story that would have been the outcome of that meeting? I would love to read it. While I recognize and support your right to your opinion, you have no “right” to a separate set of facts. You clearly do not understand that the decision as to whether or not to resort to the ICJ for a definitive ruling on all the legal aspects of Guatemala’s claim comes after the failure of our efforts at negotiations and arbitration to resolve the dispute. The fact of the matter is that agreeing to any peaceful dispute resolution mechanism cannot be equated as “legitimizing” Guatemala’s claim. And while you have a right and a duty to criticize, just saying We No Want No Guatemala hardly seems a feasible policy for resolving this issue. Guatemala has been “re-drawing” maps for decades, and does so as it chooses and all we can do is protest that they should not do so. We can only demand that those maps not be used in any official capacity in any bi-lateral, regional or international forum. It is interesting to note your partial quote of Britain’s position on the issue and your complete failure to make the connection between the first declarative statement that it supports the ICJ and its second that it is keen on a long term solution. Britain’s position is the same as every other country that supports us in our efforts to resolve this matter, and clearly that support includes us resorting to the ICJ. It is interesting finally, to note that you offer no basis for your opinion that Guatemala’s claim was on life support. I can only surmise that you do so because there is none.